What a generous & lovely gift from Roz - you're not kidding you met some wonderful girls! Of course, I would love to be in the draw. Would love to be in the drawing for the beautiful bracelet. What a gorgeous braclet and how generous. Please include me in the draw. Love your blogsite - have become an addict on "linking" to other sites. Please include me in your "bracelet draw". You sure are a busy little girl Marg!!! Sounds like you had a lovely weekend away last weekend and are in for another wonderful time this weekend. I have found that the Patchwork/Stitching world is full of so many talented, generous and lovely people. 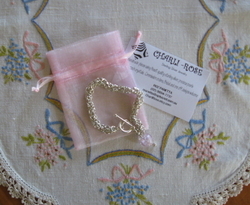 Please include me in the draw for Roz's beautiful bracelet. Marg, lovely to meet you at Warracknabeal. Thanks for introducing me to another craft, "Punching". Look forward to making some of your patterns. Great day. Just found your blog through a link. Would love a chance to be in the draw for the gorgeous bracelet. Hi Marg, I was at the Girl's Day Out. It was my first time and it was a lot of fun. I hope to go again next year. I am currently stitching your Christmas Tags(packs 1 & 2) I bought on the day. I would love to be included in the draw for the bracelet.